Translating Ceramics: Neolithic to digital, to contemporary social object. By Graham Hay and Dr. Neil Carlin. Objects have stories to tell and in the telling of these stories, they often reveal things about ourselves that may not ordinarily be apparent. This is the story of an academic and artist on opposite sides of the globe, their conversations and the resulting two, 2m high porcelain and paper sculptural objects, custom made in Western Australia for the 2014 Dublin Biennial international art exhibition. After four months of email-based discussions, the two authors - Graham Hay, an Australian-based ceramic artist from NZ and Neil Carlin, a Dublin-based archaeologist - shook hands as they met for the very first time on 13 June 2014, at the Dublin Biennial. 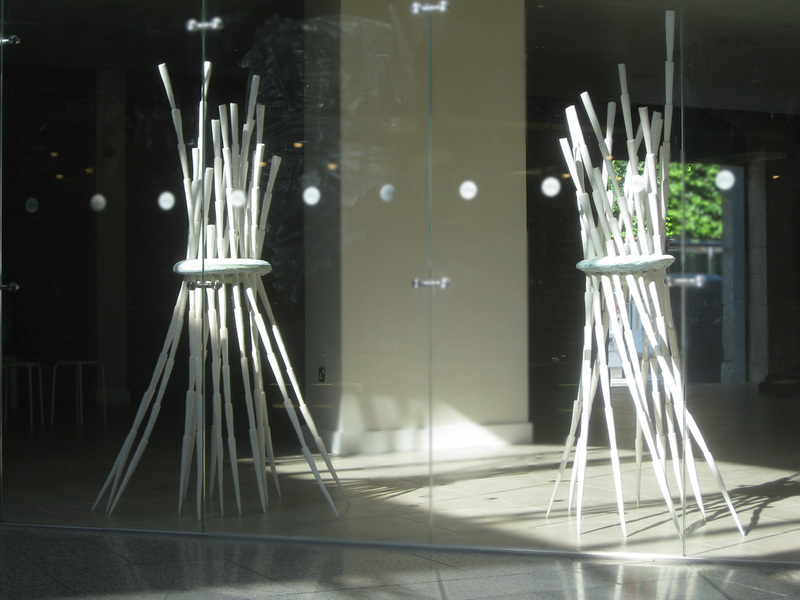 Before them, stood Graham’s sculpture which had grown out of their conversations. This conversation had originally began with an email from Graham inquiring about Neil’s doctoral research on the role of Beaker pottery, a prehistoric ceramic used across Europe around 4,500 years ago. Archaeologists have struggled to explain the sudden appearance of this pottery across Europe and its occurrence as part of an assemblage including early copper and gold objects with burials; hence it has been labelled ‘the Beaker phenomenon’. This ceramic was introduced to Ireland from Atlantic Europe at broadly the same time as the first metals. Archaeological investigations have resulted in the discovery of this international style pottery throughout this island, however, unlike in Europe, this pottery has rarely been found in graves. 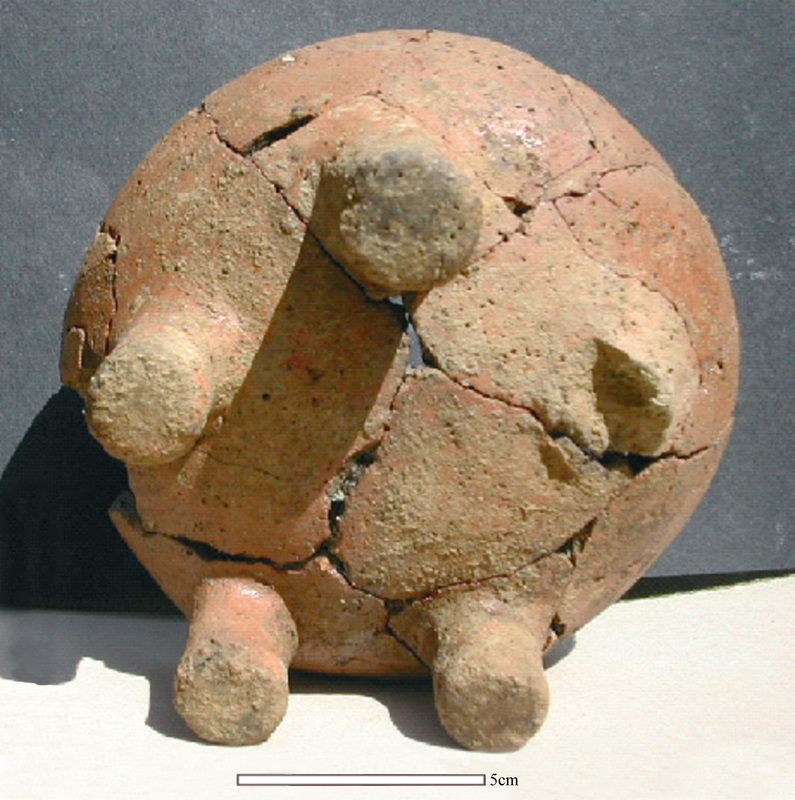 Neil's research thesis included mention and images of a particular Beaker pot type of Central European origin with multiple feet known as a polypod bowl. A total of 16 polypod bowls, including examples made from wood, have been found at 12 different locations in Ireland, predominantly in the eastern parts of the island. The wooden versions have generally been found intact within bogs, while only small fragments survive from most of the ceramic ones. This is largely due to the particular depositional treatments that these received. In Ireland, most of the Beaker pottery, including polypods have been found in a highly fragmentary condition alongside burnt food remnants and stone tools within the poorly preserved remains of what were once much larger heaps of occupational debris. The condition of the pot sherds indicate that they had been broken for some time before being gathered up and subsequently stored in these piles. At least some of these collections seem to represent the deliberate curation of the physical remains of particular social gatherings. Some may also be a by-product of everyday household activities, though it is difficult to be certain. We know that people used these assortments of debris as a resource, from which they obtained small quantities of these materials that were then ceremonially deposited in a range of different settings. Often this comprised the placement of these fragments into specially dug holes. These Beaker pots, especially the polypods were highly symbolic objects that must have signified many different things to the people of their time. Stylistically, they made physical references to other people in other places across Ireland and Europe who were also using this same type of pottery. Each of these pots would also have had complex biographies. They were imbued with the stories of those who made them, the occasion they were made for and the places where they were used. These associations may have been highlighted during their removal from the piles of occupational debris, just before they were buried below ground. For once we know something is going to be permanently removed; we are forced to commit it to memory. While most Beaker pots served a wide range of uses, including everyday functions, at least some of the polypod bowls were probably used for the exchange of foods or liquids during social feasting. Some of these footed pots had been made to look good, rather than last a long time. This suggests that they were made specifically for an occasion rather than for everyday use. Significantly, at least some of the polypod bowls had been deliberately broken. This may have been to bring the use of these bowls to an end, but it may also have served to create various fragments of the bowl that could be taken away as a memento. People may have kept different fragments from the same bowl to materially represent their symbolic links to each other, to that time and that place. We can view the piles of debris as repositories of meaning and memories which can be compared to the way that photo albums act as physical record which assists in retelling the story of a particular occasion or series of events. Taking this metaphor further, we can see the sherds as being like polaroids, representing a snapshot of a particular time and place. When I was selected to exhibit in the Dublin Biennial, I decided to make something that represented the long journey to the event and the ceramic culture there (or how I saw it). My online research lead me to a description of Neil Carlin's PhD, so I emailed him. He promptly replied with a copy of his now completed thesis. I discovered images of multi-legged wooden and ceramic bowls. 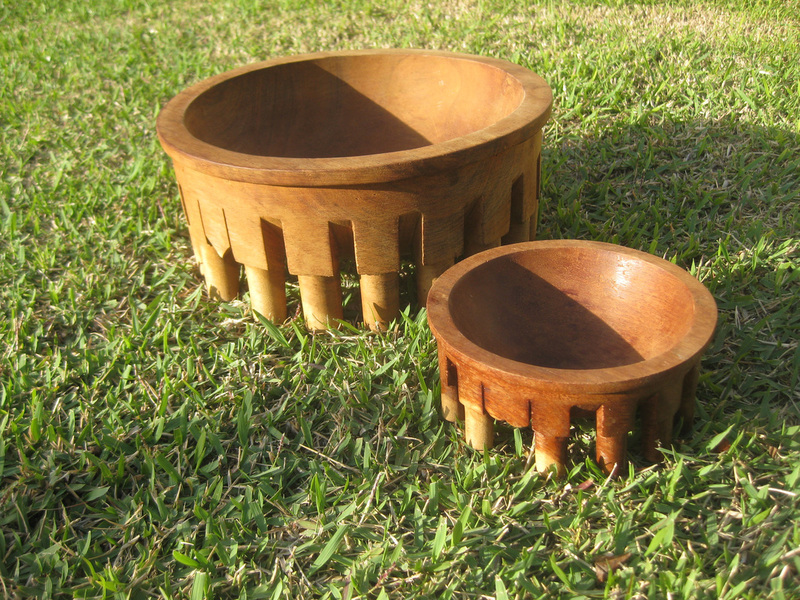 These bowls immediately reminded me of what I had previously seen in Western Samoa 23 years ago. In 1991, while visiting family in Western Samoa I became fascinated by Polynesian tanoa ('ava / Kava bowls, see http://en.wikipedia.org/wiki/Samoa_'ava_ceremony) and carried home a 14 and a 18 foot bowl. Inspired by Samoan tales of consensus-based (unanimous) rather than democratic (majority) decision making in selecting matai (administrator of the family property), I begun to see the legs as representing an egalitarian community holding up a communal bowl, which all figuratively and literally equally drink from. A year later I created my own ceramic version, with a woven surface top to imply social integration. Over the next 23 years I moved away from this form, but still sought to represent social systems and gatherings. I revisited the form and ideas for the Dublin Biennial, as I see this artist-initiated and -funded event as a meeting of equals, rather than part of the conventional and conservative international market and nationalistic contest of art 'champions'. Neil's comments about the ritual use and dispersement of the fragments of the eolithic ceramic objects provided pointers to how my two sculptures might be “consumed” in Dublin. Previously I had gifted sections of my sculptures to other exhibiting artists at the 2013 Florence Biennale, as a memento of conversations and friendships. Noting that mead was invented in neolithic times, I begun to design and make an object that would be both sculpture, and be drunk from by the 50 exhibiting artists, and Dublin audiences. This tied in with my kit-set method for moving large delicate ceramic objects internationally. For example, last year in Italy, I built three, two metre high porcelain sculptures from sections carried all the way from Australia in a single, small carryon airline bag. While these parts had been long solid rods with recesses in one end, for this project I hit upon the idea of making short porcelain flute shapes which would fit together to create the bowl legs, would pack compactly top to tail, then come apart to be used to drink from. Based upon Maggie Magee's (the Biennial Director), estimates of attendees, I designed two, 16 legged bowls, made from over 300 flutes. Half the flutes supported the middle bowl part, while the rest rose above them like random bamboo shoots. This was a case where aesthetic was a result of function. Referencing the wooden polypod bowls of both Ireland and Samoa, I wanted to use paper to make the central vessel/bowl sections of the sculptures out of “artificial wood”. Having closely followed the 3D printing revolution (also recently hacked a RapMan, converting it to a clay printer see http://www.grahamhay.com.au/3dprintingclay.html), I begun corresponded with Mcor Technologies (the Irish 3D paper printer) and their Australia distributors. I thought it might be poetic if the central paperwork could be created in Ireland, for a work which held the participant's drinking flutes! Unfortunately this was not financially possible at this stage, so I handmade the “paperwork” sections in my Western Australian studio. This is a [waterless] process I had invented over the last twenty years (see http://www.grahamhay.com.au/paperman.html). However, I was later able to select paper that was both time and place specific – 1000 recycled, redundant maps of areas of Western Australia. 3. Dublin Biennial discussions and ritual. During the Biennial a 'panel conversation' was held between artist David Orr and Graham Hay, archaeologists Alan Peatfield and Neil Carlin on 14 June: The presentations and public discussion focused on ritual, objects, subjects, symbols, metaphors and miniaturisation. During this event a public ceremony occurred where we partly disassembled and used some of the porcelain flutes from the polypod bowls to drink Australian wine. Closely linking the sculptural form and this group ceremony conveyed an egalitarian ideal. All 50 people at the talk both consumed the wine and the sculpture, the latter by drinking from and then taking away a section of it. The work could not be possessed by a singular person, but is shared equally by all. Over three more Biennial functions, the top half of the sculptures were used and taken away by audiences, to leave new forms comprising just the bowls and legs, strongly echoing the original Neolithic and Polynesian forms that inspired it. After the event, the remains of the two sculptures were to be separated, one to be buried in a private ceremony in the Dublin countryside, the other “buried” in the Australian Embassy in Dublin or back in Western Australia soil. By looking at how people lived in the distant past, we can enrich our understanding of how and why we do the things the way we do in the present. In oral societies, such as those that inhabited prehistoric Ireland, the telling of stories would have been an essential way of making sense of the world and documenting the past. Objects and materials played a key role in people’s social lives, particularly in the communication of meanings and values. These were used as symbols and metaphors to facilitate the creation and maintenance of connections to other people, places & times. This is very well illustrated by the Beaker pottery and Graham’s modern-day version of a Beaker-type polypod bowel. It seems obvious from their distinctive treatment that pot-shards were seen as objects that both possessed and created meaning. Graham's sculpture made reference to the material culture and social practices of a distance times, in the same way that these ancient bowels had made reference to faraway places. The biennial was the sole raison d'être for Graham's sculptures. Just like some of the polypod bowls, these had been specially made to be seen and used at a specific event involving an international assembly of artists who journeyed to interact, share, celebrate etc. Every piece is almost identical but yet unique, much like the way the sherds from one pot are all similar but different. Every part exists as individual entities which have a relationship to each other because they constituent parts of the same object. The sculpture echoes the accumulation of sherds and other materials in a large pile, the various parts come together to form something greater. It also acts as a metaphor for our desire to belong to or be part of something bigger than ourselves. By taking away a flute, we have become part of the story of Graham;s polypod. After the breakage of the bowl, the flutes and sherds take on a life of their own independent of the object to which they once belonged. Post-breakage, they retain the meanings and associations of the object they used to be part of, but their own story continues to be created. This resembles the extraction of a few sherds from a much larger reposity. The deliberate fragmentation of Beaker polypod bowls was replicated during Graham;s ceremony. Extra meaning has been added to the flutes, they were ceremonially dismantled/fragmented as part of a performance in front of an audience. Many of the flutes were filled with wine and each participant drank from them before taking them home as a gift from Graham. Through the sequence of acts involved with the ceremony, a series of new social relationships were developed between the people who attended the Biennial and partook in the ceremony. The flutes materially interconnected these various people from around the world. Through these flutes we are part of a community, er are constituents of a much greater entity. Each witness has a memento/relic that acts an aide de memoire of that occasion. This echoes the way that people become materially enchained through the deliberate fragmentation of pottery in the distant past. These flutes both represent and create a new part of our personal life-stories/social identities. 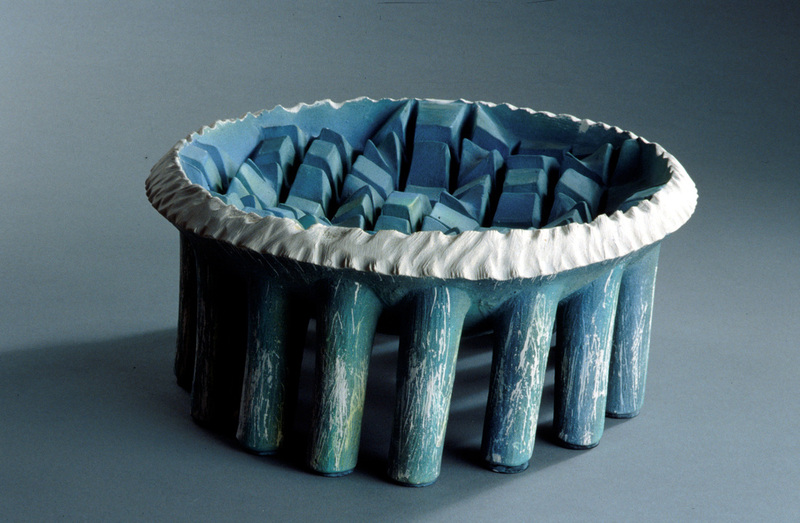 The actual bowl part of the ceramic sculpture was made from paper maps of the world showing green islands linked together by the blue of the sea. This depicts the way that these flutes now link different people in different parts of the world, echoing the social role of the Beaker pots from 4500 years ago. Some may question my sanity: For this project, I spent weeks of sleepless nights struggling with each new problem, and hundreds of hours in the studio developing and finally making, glazing, and firing over 350 porcelain flutes, to have nearly 50 break. Then individually packing, shipping and final assembling (with help) the 302 parts into the two sculptures, with the sole intention of giving them away, and coming home with nothing. However, this was a project I really “exercised my creative muscles” on. I found the whole process exhilarating as each problem was solved, each challenge addressed, and finally being able to stand back and look at the work, and think “I did it!”. The seed for this work comes partly from the culture surrounding the ceramics medium and from my working environment. Ceramics is an art medium with deep historical and contemporary roots in making functional tableware. These are also art objects made to be displayed and admired, but also to be handled and used. Due to nature of the material and high cost of equipment (resources and time), most clay workers readily share facilities, equipment and technological knowledge. Moreover, unlike many artists who work alone in their studios, my studio practise is a very social experience. I share an open plan studio with 4 other artists and over 60 students. Being in an inner city park, we see hundreds of people relaxing, socialising and drinking outside, as well receive a steady stream of often unannounced visitors. Both consciously and unconsciously, all these things feed into my thinking and making. As artists, we sometimes forget that our sole role is to gift others unique personal and collective experiences. There is a tremendous feeling of liberation when we live solely to create such experiences, rather than to purely make objects (or commodities). Visual artists and crafts people sometimes become confused, obsessing narrowly on the image or object, yet it is the quality of the whole experience that distinguishes a good or bad artwork. With the advancement of mass production and now 3D print technology, I believe a reminder of our primary role is timely. The orthodox art events present singular images and objects for individuals to experience. The market encourages individuals to purchase artworks for private enjoyment or to become symbols of their personal taste, wealth or social location. However it is the collective experience of art which offer a heightened transcendent experience, diminishing feelings of alienation, by recreating timeless social rituals and social memories of belonging.